I realize there are people out there who hate brussel sprouts. Other people out there can’t stand blue cheese. For those people don’t stop reading just yet. I like both so it’s no wonder I like this salad. Baby Lady likes brussel sprouts but not necessarily blue cheese. She thinks this salad is divine. Our youngest son, Knothead, doesn’t like either one but oddly enough he likes this salad. There is something about the combination of flavors in this dish that come together to make a fabulous salad. Perhaps it’s because it is loaded with bacon flavor and bacon makes anything taste good. Maybe it’s the apples or the sweet tanginess of the salad dressing. The brussel sprouts are just lightly cooked so they wilt but retain their brilliant green color and a little chewiness when you eat them. The blue cheese is definitely present but by no means overpowering or a prominent flavor in the dish. You get the toasted pine nuts for a little texture and their buttery flavor. It’s just so good with layers upon layers of flavors and textures all in balance. This is a salad you simply have to try. You can eat this salad as a side salad with dinner or as an entire meal. 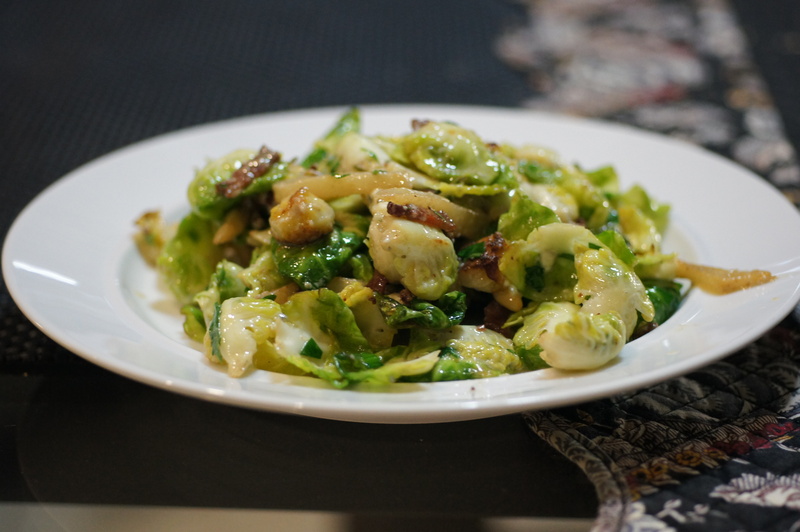 It is a hearty salad, has loads of flavor and will surpsie you how good it is, even if you don’t like brussel sprouts or blue cheese. 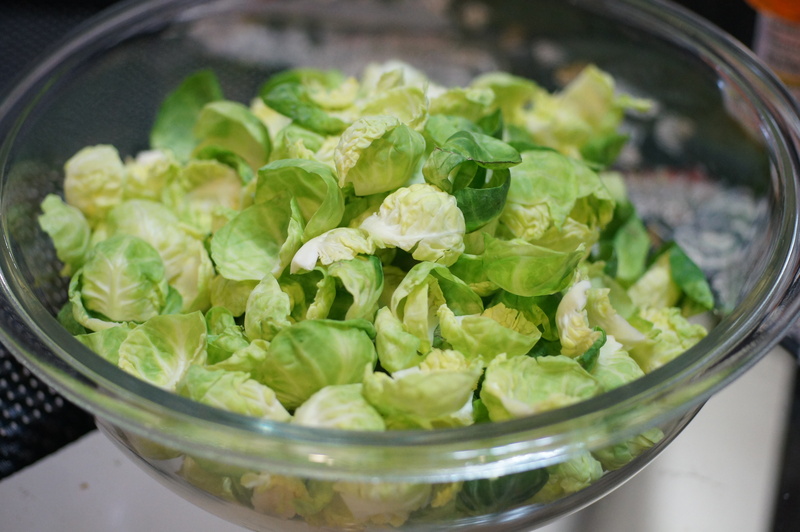 Peel the leaves off the brussel sprouts and discard the core. Preheat the oven to 425°. In a small baking dish, toss the Granny Smith apple quarters with 1 Tablespoon of the olive oil and season with salt. Roast the apple quarters for about 15 minutes, until they are very tender and browned in spots. 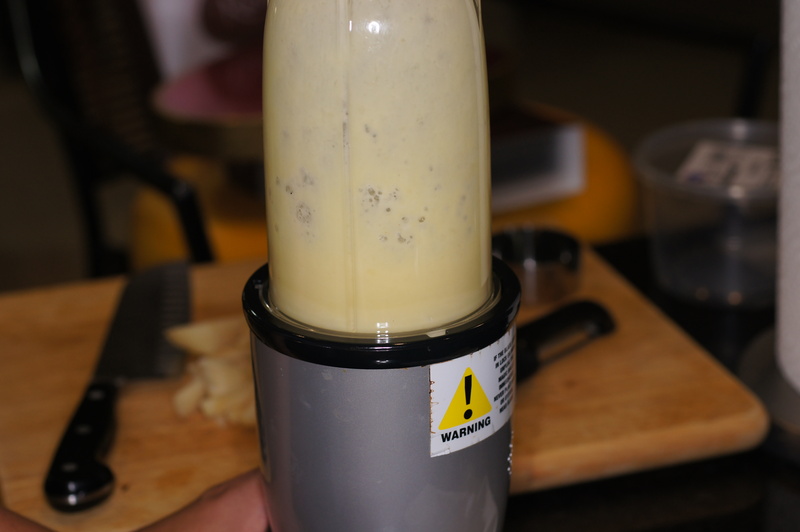 Scrape the apple and its juices into a blender along with the water, cider vinegar, Dijon mustard, shallot and oil. Puree until the dressing is smooth. 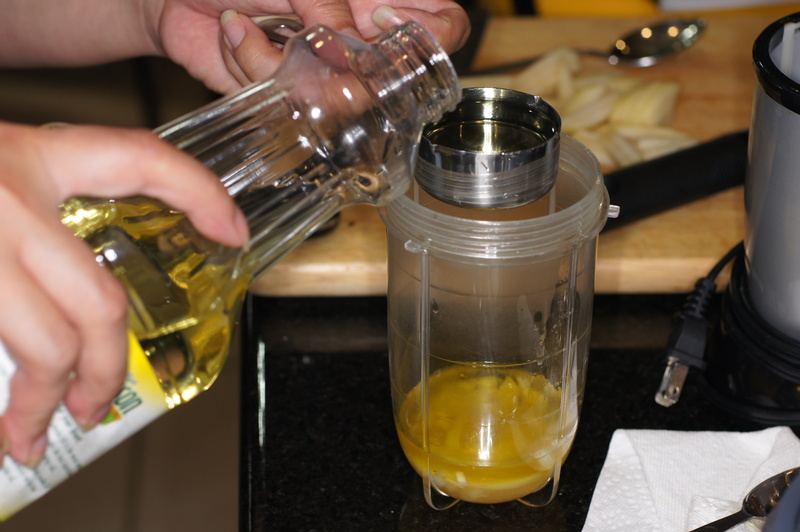 Season the dressing with salt and pepper to taste and refrigerate. In a very large skillet, toast the pine nuts over moderate heat, shaking the skillet, until the nuts are golden, about 4 minutes. Transfer the nuts to a plate to cool. 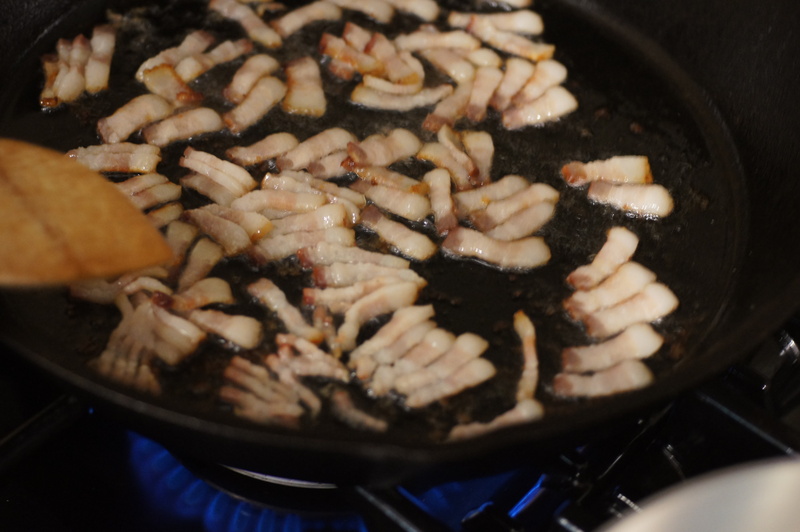 In the same skillet, fry the bacon. 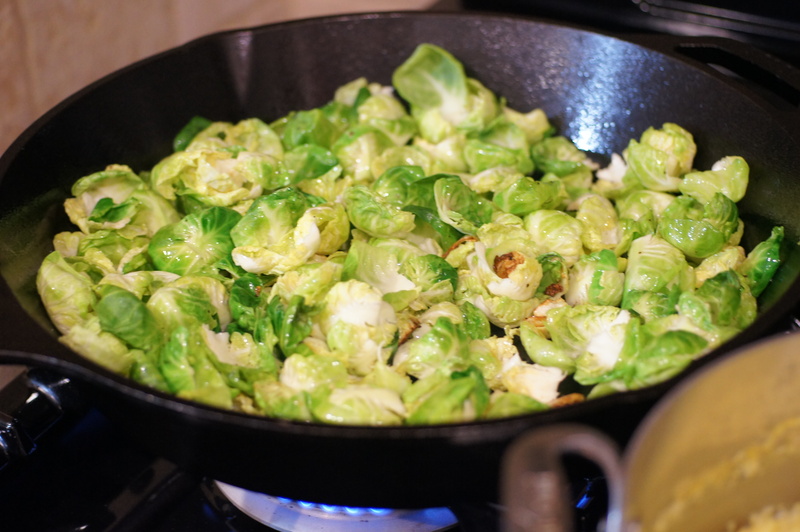 When done, remove the bacon from the skillet so as not to burn Add the brussel sprout leaves and Fuji apple and season with salt and pepper. Season with salt and pepper and transfer to plates. Crumble blue cheese over the salad and sprinkle with the chives. Toss to incorporate. Serve and enjoy. 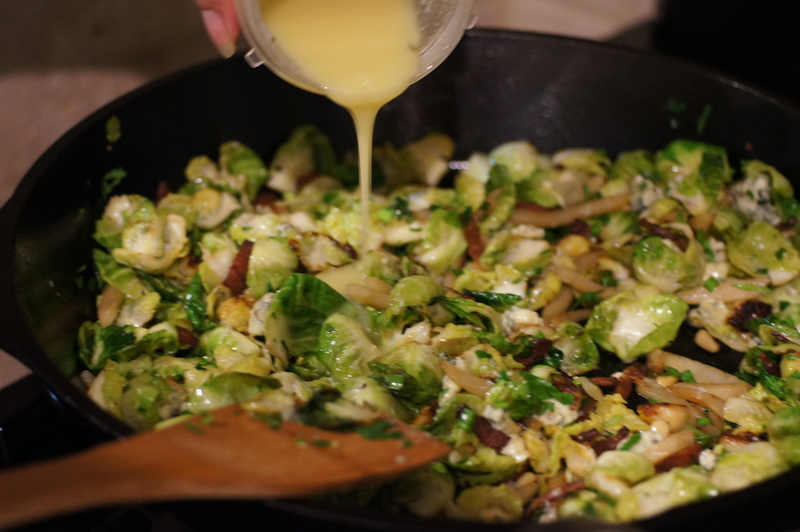 Big fan of brussel sprouts and this recipe sounds delicious! Never thought to include apple or blue cheese but I will now. Thanks! Thanks, John. I think you will like it. Always nice to see you around blogsphere. Looks yummy…will give it a try. Thanks for dropping by and your nice comment. If you give it a try, let us know what you think. We love feedback. Hope all is well in your world. 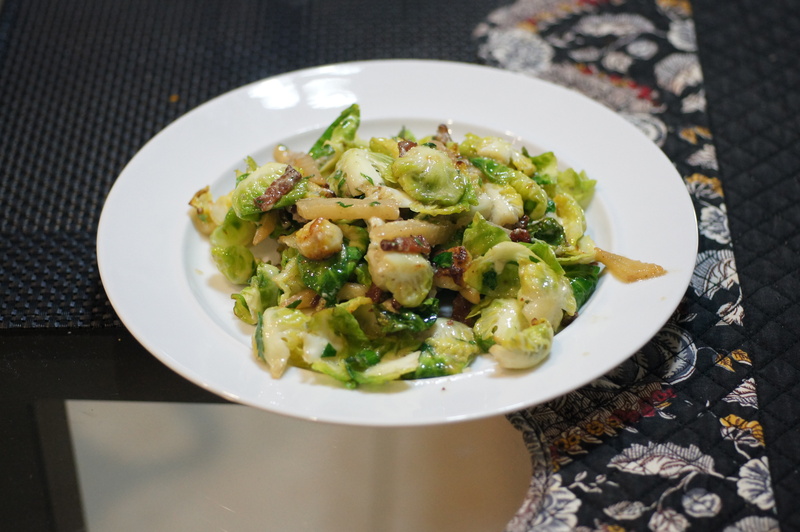 I love both Brussel Sprouts and Blue Cheese. But most of all I LOVE BACON!!! I will give this salad a try this weekend. I saw this on facebook and knew I’d love it – brussel sprouts are my FAVOURITE vegetable (strange but true) and I never met a type of cheese I didn’t like. This looks like heaven on a plate to me, can’t wait to try it. Thanks! Thanks so much. I’m glad it caught your attention and you like it. This really is a delightful salad with unbelievable depth of flavor. If you can’t take the blue cheese a nice goat cheese will work well, too. We’ve also made it with pears instead of apples. This looks excellent and I can’t wait to try it, but I have one question. I have only had one type of blue cheese in my life I have actually liked (It was some sort of a smoky flavored blue at Panera). Can you recommend a good blue that doesn’t have that sharp bite. The cheese you are looking for is Smokey Blue from Rogue Creamery in Oregon. You can order it online at roughly $25/lb. If you don’t like blue cheese, you can substitute feta. The sharpness of the blue cheese is counterbalanced by the apples and the bacon so even a sharper blue than you may be used to is mild in this salad.